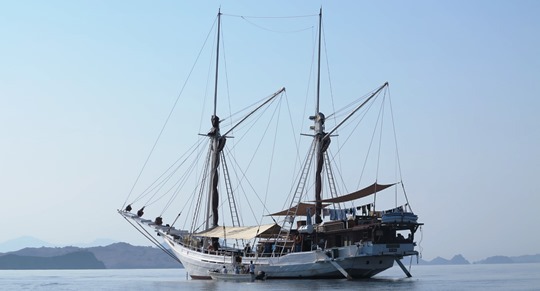 ▲ I spent five days aboard an Indonesian phinisi sailing around the Komodo Islands. The Katharina is a newly built (1998), all wooden Bugis-style schooner, operated by Bali-based SeaTrek. I was the guest lecturer on this pre-Ubud Writers Festival voyage. ▲ For me the biggest surprise was revisiting the port of Labuan Bajo at the western end of the island of Flores. In 1974 Maureen and I travelled through Labuan Bajo on our way to Komodo to see the famous dragons and then continue on towards Bali. We arrived with four other travellers on a chartered fishing boat, there was no road to Labuan Bajo, no regular shipping service and certainly no airport. There was also nowhere to stay, we slept on the verandah of the police station, getting up at dawn every morning to stand to attention while the Indonesian flag was run up. 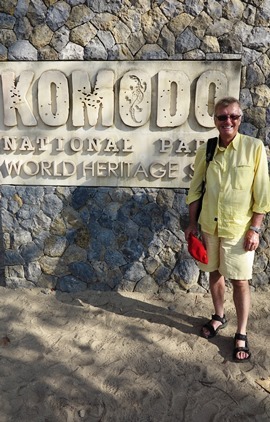 Things have certainly changed, flights every day, lots of cars, lots of hotels, lots of scuba diving operators, lots of boats off to Komodo National Park to see the dragons. ▲ Of course we saw dragons, those crocodile size big brothers to the geckos you often see on the ceiling of your room in Indonesia. 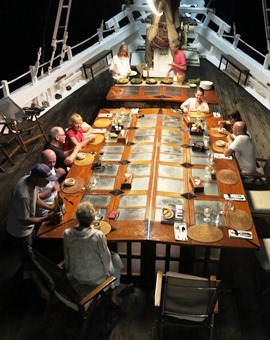 ◄ We lived very well on the Katharina, a comfortable boat where we dined outside around this big table every night. We dined especially well because the Ubud Writers Festival is fun by restaurant owner and cooking school director Janet de Neefe. The food on board was all provided by Janet and her expert chefs. 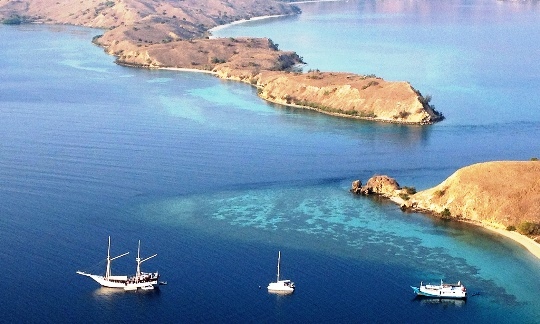 ▲ Apart from dragons we also saw some beautiful beaches and islands, here our boat and two others are anchored off the smaller island of Gili Lawa Darat with Komodo Island in the background. The catamaran in the middle is Xanadu from South Africa, on an extended trip around the world. There’s wonderful snorkelling around the Komodo Islands as well as great scuba diving, a highlight was an extended encounter with manta rays at Karang Makassar reef (aka Manta Point). 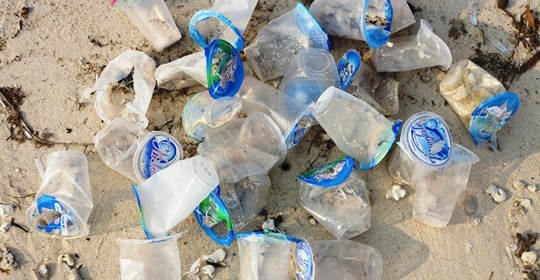 ▲ There is one downside to Komodo, the sheer amount of plastic trash washed up on those otherwise pristine beaches. Handy one-serve drinking water cups are a particular culprit. 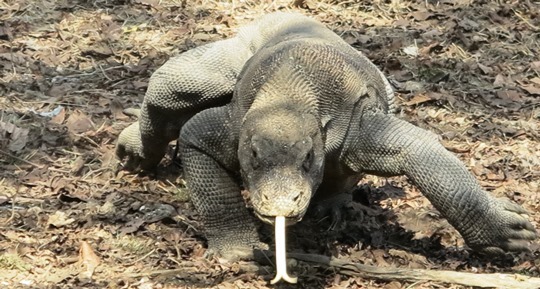 The Indonesian government takes in huge amounts of money in park and visitor fees from all those dragon watchers and scuba divers, how about putting a little bit of it back into some garbage collection and beach cleaning? An honourable exception to this neglect: I encountered a group from Divine Diving out of Labuan Bajo doing some beach cleaning. It’s good to see at least one operator doing the right thing.